blogadda flowers wow Flowers at the Door Inc. The early morning sun peeped in through Julia's window as the clock struck 7. Julia was tired after frequent spats with her boyfriend Stanley. She tied her hair up in a bun and threw open the window curtains. Having cried the entire night thinking about Stanley, she cursed her fate. She quickly went downstairs and opened the door. Her eyes witnessed a flower bouquet lying in front of her door. While picking the flowers, she located a note. "Sorry Julia. Let's meet at Mario's at 7.30 PM. Love" She read and dumped the flowers in the nearby dustbin. Stanley was her first love, a best friend for life. Although they used to fight like a cat and Dog, they were fond of each other. Frequent quarrels followed by patch ups described their lovely bond. It was 7.15 PM as Julia drove her car towards the St. Bernaud's Intersection. Mario's was a local cafe located at the Rocky Beach road. The evening breeze brushed her ebony dark hair as she drove her car along the road. The evening sky displayed a unique orangish shade and the setting sun only made it look more beautiful. It looked like a beautiful canvas painting. People of all age groups were seen meandering at the beach. Julia parked her car outside Mario's and stormed into the Cafe angrily. Her eyes scanned through the cafe and saw Stanley waving a hello to her. Maintaining a straight face, she decided not to make the first move. Stanley was busy munching the chicken nuggets. There was a deafening silence for 5 minutes. None of them was willing to initiate a talk. Stanley and Julia knew each other since the age of 11, from their secondary school days. The waiter, Antonio, familiar to both came and broke their silence. "Too much of silence too bad for health...Here is a Mario special for Julia," he said and handed her a glass of Bloody Mary. She acknowledged him back with a smile. She looked at Stanley and saw no feeling of guilt nor repent. That angered her more. Stanley cleared his throat and said, "Did you get my flowers?" "Yes, I did," she said. "How was it?" Stanley asked, "Did you like it?" "It's just artificial as you, Stan!" she said, abruptly. "And you know I hate fake things. Be it flowers or humans," she continued, "You could have dropped by and said a sorry instead." Stanley looked at her and replied, "I had some work." "Your lame excuses as usual." she retorted. "You could have sent me a real flower from a garden or somewhere. You know I love roses, the red ones. Real Fresh flowers with a handwritten note would have melted my heart" Her eyes welled with tears. "I have dreams of togetherness with you, Stan," she said. "We are 19 already and you couldn't find a job," she added. Julia was mad at him. Not ready to give him another chance, she decided to leave him. Once bitten , twice shy! "You know I thought one day you would be famous and I would proudly call you mine." Julia continued. "We will be," Stanley replied. "Shut up!" She said, brusquely and left the Cafe. The next morning, as usual, he was waiting for Julia at the St. Francis Church. Hours passed, he never saw her. He visited her house. But she wasn't there. Months passed and he never saw her again. Memories of Julia had started to haunt him. Her absence started disturbing him. "Real Fresh flowers with handwritten notes would have melted my heart," Her voice flashed on his mind. Looking at the little kids playing in the garden reminded him of his young days with Julia. They used to meet every day at the same park. He observed two young couples, very much of his and Julia's age arguing with each other. "Enough is Enough, Jack.Don't want to see you again," the girl screamed at the guy and left angrily. She reminded him of Julia. Sooner, he followed her to her house. A few hours later, he purchased a bouquet containing fresh red roses. He wrote a note on it. "I'm imperfect in a lot of ways but it's you who makes me perfect. I'm sorry for everything. :) Jack! " He soon placed the flowers outside the girl's door and rang her door bell. He hid behind a tree and watched. She picked up the flowers and read the note. She smelled the fresh rose and smiled instantly. The next day he visited the same garden and he saw both of them cheerfully conversing with each other. That was when he realised that Julia was right. A fresh flower could melt any girls heart. He decided to help people like this. And when it worked well, he thought of giving wings to this and setting up his own business. "Flowers at the Door!" He set up a shop outside his house. He started planting roses in his backyard. He distributed pamphlets in his locality informing everyone about his new business. "Delivering Fresh flower bouquets across Jacksonville. Fresh flowers can melt anyone's heart. Ready to serve and unite bonds." The Note on the pamphlet read. One fine afternoon, he was whiling away time at his shop waiting for his first customer. It was hoping against hope and he wasn't even sure if this would work. It was that moment when he got a call on his landline phone. It was his first order. "Stan here from the Flowers at the Door. How may I help you?" "Listen man. My girlfriend is mad at me. I want you to help me out. Just deliver some fresh red roses at her house with a personalised message," said the voice. "Sir, any specific message for her?" Stanley asked. "Anything that you wish," said the voice. Stanley noted the girls address. He soon plucked some flowers from his backyard and arranged them neatly in to a bouquet. He wrote a nice message on a card for her. At 5 PM, he delivered his first order. Two hours, later he got a call from the same customer. "Stan, man, you are simply awesome.She is impressed." said the person. The guy arrived at Stanley's flower shop and handed him $30. It was his first earning. The news of his shop and his services spread like a wildfire. People started appreciating his work. 'Flowers at the Door' got famous. He started cultivating seasonal flowers and his business got to a next level. During this moment of joy, he started missing Julia badly. She was the sole reason behind this. Her words had inspired him to start this. Something that started as an experiment was growing to a full-fledged business. He started generating great revenues out of it. He hired few people to assist him. He, later on, set up branches in Texas. And eventually 'Flowers at the Door' saw itself scattering across the United States. Years passed. He worked on improving his business model. Luckily, he had great minds working for him. He expanded his business to Europe and Asia. He was shortlisted for the Young Entrepreneur award. Stanley grew more popular with time. His company worth increased to $ 1.5 Billion. At 45, he was already in the top 50 richest men list by Forbes Magazine. But even during his busy schedule, he never stopped thinking about his first love, Julia. During the month of October, Stanley was invited for the International Business Summit to be held at Brussels that would be graced by the presence of various Businessmen of famous enterprises across the Globe. It was a balmy Saturday afternoon, Stanley was escorted to the Hilton International hotel at Brussels where the event was to be held. He was awarded with a special award at the Summit. Sooner, he was interviewed by a famous BBC news reporter Cristina Baxley. "Mr. Stanley Watson, did you ever think that you would reach this far?" the interview asked Stanley. "To be honest, I never thought. At 19, I was tagged useless by my girlfriend who later ditched me." he replied. "Oh! that must have been rude," she said and continued, "Didn't you make any attempts of reconcillation ?" "Not just once, there wasn't a single day when I had not visit her house." Stanley replied and continued, "It used to remain locked." "Mr. Watson, that's tragic. I understand how difficult it must have been to lose your first love like that." "Exactly," Stanley replied. "Miss. Cristina, the worst part is that I don't know if she is alive or dead. What I am today is all because of her. I owe everything to her. You all know me as a billionaire and a philantrophist Stanely Watson, but her memories haunt me." "Why didn't you move on?" Cristina, the BBC interviewed asked Stanley. "No one loved me so madly like her. Perhaps I was addicted to her. She was a drug to me." Stanley replied. "How did you go about with this Flowers at the Door thing?" she asked curiously. "It's a funny story. It was my attempt to unite two individuals who loved each other. I placed a handwritten note along with some fresh roses outside the girls house." "Then.. it worked. An idea struck me and I created a garden outside my house and then came my first order,"he continued. "With time we decided to expand our business. The best thing was people loved us," he said. "That must be a great motivation to you, no," she said, smilingly. "Off course it was. 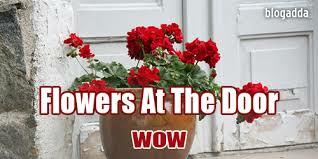 People used to write mails and call us informing how much they liked Flowers at the Door. We got some many client testimonials"
Cristina Baxley smiled at Stanley. "Mr. Watson, we wish you all the best. We wish that your lady love watches this interview and gets back to you." she said. "Thanks Cristina." He said," I'm unsure if I would ever meet Julia again. Anyways Thanks!" He soon left for his hotel room. That night he couldn't sleep properly. There was something that was disturbing him. "Julia , forgive me baby.." he murmurred as his eyes closed shut. The next morning he took the first flight to Texas. He freshened up and left for his office. He was a workaholic and everyone was aware of his love for his Company. He started reviewing the mobile application design with his Engineers. "Mr. Watson, there is an order from someone called Julia Stewarts," the store manager hurriedly came and interrupted Stanley during his meeting. Stanley's heart almost stopped beating. He quickly rushed to his computer and checked the order number. "I want you to deliver fresh Roses to your boss. Tell him I am alive and I still miss him." Reading that his lips curved into a smile. He made a note of her address that was stored in the database. Sooner, he collected some fresh red roses from his garden and created a bouquet. "Missed you , Julia. No words could express my feelings. I miss you and I'm happy you are back. Love you!" He wrote a note. He wore a dapper outfit. He drove his car to Julia's home and placed the flowers outside her door and rang the door bell. He hid behind the tree and was waiting for Julia. Julia opened the door and located the flower boquet lying on the floor. He smiled as she read the note. She knew it was Stanley. Julia looked beautiful even at 45. "Stan, Is it you?" she asked curiously. Stanley appeared in front of her. "You've grown into a smart and handsome man," she said," Come in!" Stanley sat on the couch and looked at her. "Why did you leave me, Julia?" Stanley asked. "Somethings are best unsaid. One week later ,I had come to inform you that I would be travelling to North Carolina to live with my Aunt Suzzana." she said. She cleared her throat and continued, " But I couldn't find you. I even visited the Garden where we used to sit for hours and talk. You were missing." Stanley smiled. "No power can now separate both of us now." he said," You were right?" "Right about what?" Julia asked. "Girls do love fresh flowers. It melts their heart. "he said," Thats how my business survived." "Thats true Mr. Stanley Watson, the philantrophist Billionaire," she said ,winking at him. "I have heard about Flowers at the Door but never knew it was yours until I saw your interview with Cristina Baxley,"she said. "I love you Julia!" Stanley said and their lips locked. "You snapped me when I told you that one day I would be famous and you would be proud of me," Stanley said. "Yes, Stanley, you are mine and I am so happy that we are together.So proud!" She kissed him passionately. Very well written sTe :) You have developed from the SteCock times and it's for good... Keep writing! Wow! lovely writing. loved it!